Switching from Word to PDFfiller has helped Eric Duncan process and digitally distribute multiple billing forms, work orders, invoices and forecast reports much faster and easier than before. 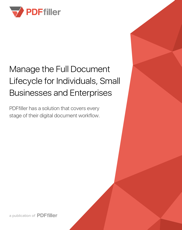 Individuals and small businesses process data and manage their document lifecycle using PDFfiller. By integrating PDFfiller into their CRM system they're able to cut costs and streamline their workflows. PDFfiller helps Scott Horton, owner of Hope Discovery ABA Services, find any medical form and send it to a client in seconds. 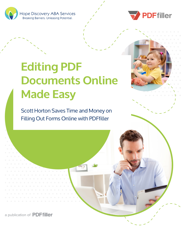 By generating and customizing fillable forms, Scott has improved his turnover rates with clients. 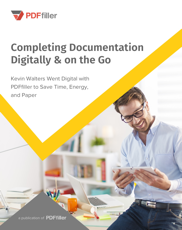 Using PDFfiller, Kevin Walters significantly minimized his paper consumption. Coordinating documentation with his employer and ensuring its accurate completion has become a fast and easy process. 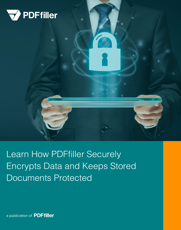 By complying with international security standards and encrypting sensitive data, PDFfiller ensures that all generated, edited, filled, signed and shared documents are highly protected. 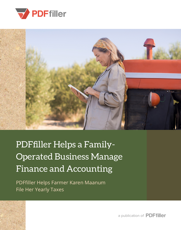 With the help of PDFfiller, Karen Maanum, a self-employed farmer, processes tax forms, manages financial paperwork and streamlines her business workflow faster and easier than ever before. 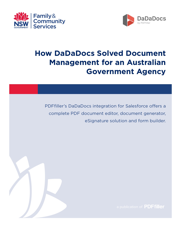 PDFfiller's DaDaDocs integration streamlines the process of generating and managing legal documents and collecting electronic signatures for an Australian Government Agency. Lindsey Scheffel, occupational therapist, uses PDFfiller to send documents with designated fillable fields to students for filling. Now the process is easier and more flexible. 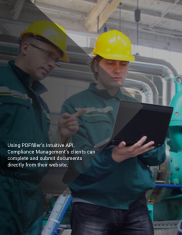 Compliance Management uses PDFfiller to help their clients securely complete, sign and submit smart fillable forms directly through the company website. 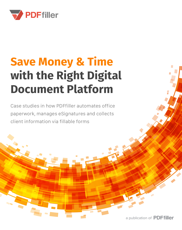 PDFfiller helped 6 of their clients save money and time by automating document workflow. Using fillable forms, clients receive eSignatures and collect customer information faster and easier. 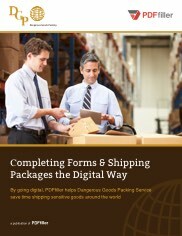 Crossroads 3PL Solutions, a leader in warehousing and shipping in Texas, goes completely digital with PDFfiller. 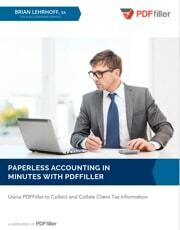 The company uses PDFfiller to complete forms, add signatures and distribute PDFs with a single click. Green Brick Title uses PDFfiller to customize commercial real estate forms. Their employees are able to customize forms from the office, on the go or from any internet-connected device. 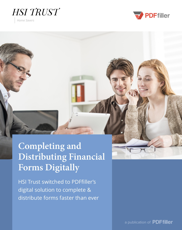 HSI Trust switched to PDFfiller to complete, distribute, and return forms faster than ever. Improving their document management has helped them deliver a seamless customer experience. 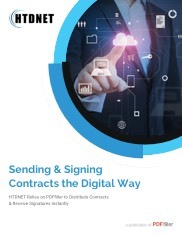 HTDNET uses PDFfiller to distribute contracts and receive signatures instantly. The process of editing documents, inserting information and adding a signature has become faster and easier. 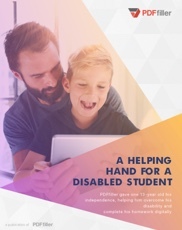 A 13-year old boy with a handwriting disability uses PDFfiller to create neat, legible documents and send them to his teacher right from his PDFfiller account. Dangerous Goods Packing Service automated the process of filling out and printing repetitive forms, shipping labels and regulatory paperwork using PDFfiller. 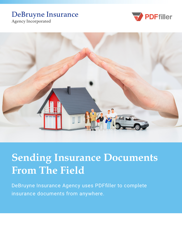 A MidWestern insurance agency sends forms and documents using PDFfiller when agents are in the field. It's secure, easy to use and faster than using paper documents. 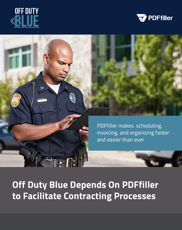 Off Duty Blue uses PDFfiller to handle the paperwork for officers to work at special events. Signing, editing and storing secure digital documents is a must for them. 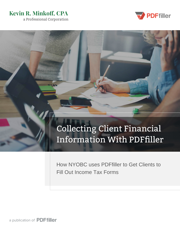 Kevin Minkoff, a Portland based Accountant, collects financial information from clients using fillable forms created with PDFfiller. Data stays organized and tidy this way. 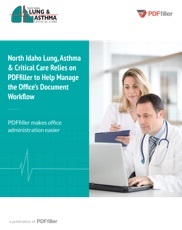 An Idaho doctor's office replaces paper forms with digital documents using PDFfiller. 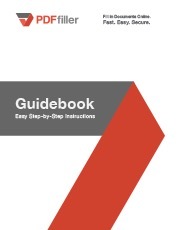 This ensures all forms are tidy and compliant. 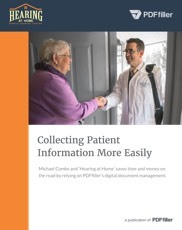 Hearing at Home is a mobile hearing clinic that uses PDFfiller to manage their documents. 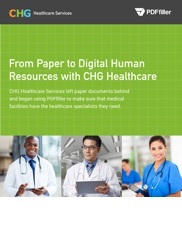 Online patient forms and cloud storage make an efficient digital office a reality. 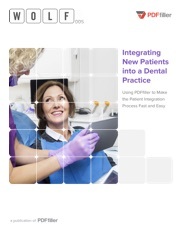 Dr. David Wolf uses PDFfiller for new patients at his dental practice by having them fill out and submit medical history forms before they get to the office. 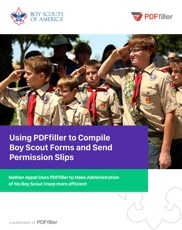 Nathan Appel, a boy scout troop leader has taken permission slips and service forms paperless. 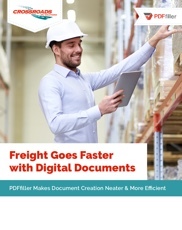 PDFfiller is the solution that can edit and sign PDF documents from any device. 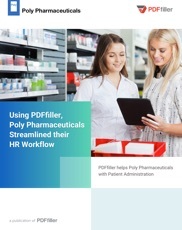 Poly Pharmaceuticals uses PDFfiller to manage their HR document workflow. Digital documents completely eliminated illegible job applications and waiting for signatures. Before PDFfiller, CHG administrators spent weeks to process privileging documents for medical professionals. 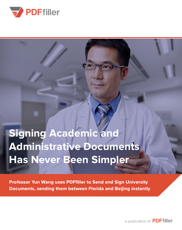 Now sending and signing documents is instantaneous. 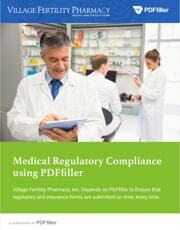 Village Fertility Pharmacy uses PDFfiller to get neat and legible documents from patients while meeting stringent regulatory standards such as HIPAA compliance. Brian Lehrhoff relies on PDFfiller to extract and analyze financial data from his clients. Importing, balancing, checking and organizing data is faster with PDFfiller. 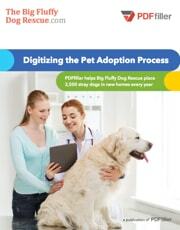 PDFfiller helps Big Fluffy Dog Rescue digitize pet adoptions. 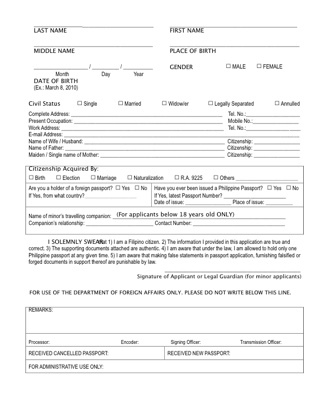 Now it's easy to create fillable adoption forms that can be completed and stored entirely online. 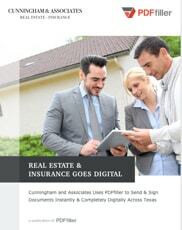 PDFfiller enables Cunningham & Associates to send sensitive insurance documents directly to clients and get them back legibly filled out and signed regardless of distance. With PDFfiller Yun Wang, a Beijing based professor, has more time for his research work. Singing and collaborating on international documents has never been easier. 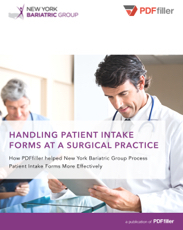 The New York Bariatric Group uses PDFfiller as a fast and secure way to collect medical information from patients, process it and import it straight into their EMR. 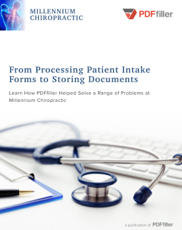 With PDFfiller, Millennium Chiropractic saves time processing patient information by creating comprehensive in-take forms that can be filled out from any device. 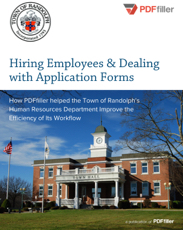 The Town of Randolph saves time and money processing job applications with PDFfiller. No more illegible documents, fax machines or wasted paper. HR forms are a cinch now. 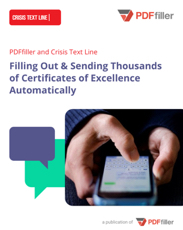 Crisis Text Line uses PDFfiller’s API as a fast and flexible way to generate hundreds of certificates. The process is completely automated and paperless. 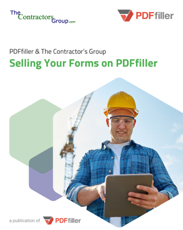 With PDFfiller, Monk and DBug contractor’s group makes it easy for their clients to access fillable forms and complete them using PDFfiller’s powerful functionality. 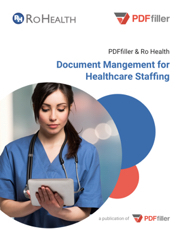 Ro Health, a staffing service, uses PDFfiller as an all-in-one, cost-effective platform to electronically send out timesheets and get them completed each week without delays. A complementary solution to the problem of building consumer trust that involves the use of a third party system to expose potential buyers to the experience of previous customers. 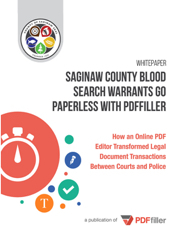 Saginaw county district court sends out, fills out and gets blood search warranties signed electronically using PDFfiller. This ensures accurate data gets to the right people faster. 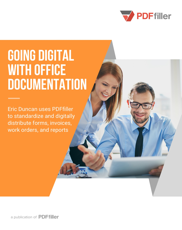 PDFfiller's guidebook offers clear, step-by-step instructions to help you create, edit, sign and share your documents electronically from anywhere. Going paperless has never been easier. Thank you for your interest in PDFfiller. 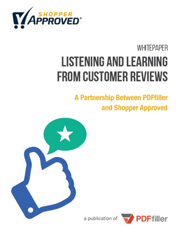 Once you complete this form, we will provide you with case studies detailing the ways in which PDFfiller contributes to our customers’ success. We'll also provide you with a trial account and a sales representative will get in touch for a more in-depth conversation.